1. Preheat the oven to 200°C, gas mark 6. Prick the potatoes with a fork; put on the top shelf of the oven. Bake for 1 hour, until the flesh is soft to the point of a knife. 2. Meanwhile, make the pesto. Put the hazelnuts, garlic and a large pinch of salt in the small bowl of a food processor; whizz until roughly chopped. Add the watercress (reserve a little to garnish), lemon juice and oil and whizz again, until combined but still with a little texture. Scrape down the sides with a spatula. Cover and keep in the fridge for up to 3 days, stirring well before use. 3. Sift the flour into a mixing bowl with the salt. Once the potatoes are cooked, hold them with a tea towel and cut them in half, then scoop out all of the flesh with a spoon. Then, wearing protective gloves, use a potato ricer or fine grater to grate the flesh over the flour. Add the egg and bring everything together with a wooden spoon. As soon as the mixture begins to clump together, use clean hands to lightly knead it into a smooth dough. Don’t overwork the mixture. 4. Dust the work surface with a little more flour, then tip out the dough and pat into a 2-3cm thick square. Cut into 2cm-wide strips and roll these gently to smooth the edges and create long sausages. Cut into 1cm-long gnocchi, dusting with flour and rolling each over the tines of a fork while pressing with the pad of your thumb to create light indentations. 5. Bring a large pan of salted water to the boil; reduce to a gentle simmer. Add ½ the gnocchi. Stir once and wait for them to rise to the surface (this should happen within 1 minute). Cook for 15 seconds more, then remove to a plate with a slotted spoon. 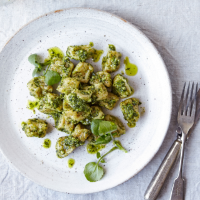 Repeat with the other ½. Gently toss the gnocchi with the pesto to coat, then season. Divide between plates and serve at once, garnished with the reserved watercress. This recipe was first published in Thu Aug 30 16:21:56 BST 2018.